QEnergySpa, BEFE - Bio-Energy Therapy. Empower your body to heal. Q the Experience, Future Life Science. Technology empowering your body to heal. A human battery charger, energizing and balancing our bodies. With every QEnergySpa, BEFE session, the enhanced bio-energy level in the water recharges the life force within you allowing your body to refresh, revitalise and re-energise itself using the energy. 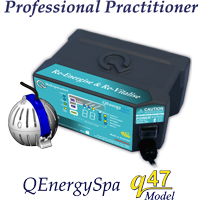 Introducing the QEnergySpa, BEFE q47 Pro. The NEW QEnergySpa, BEFE Professional Practitioner model q47. Empower your body to heal. 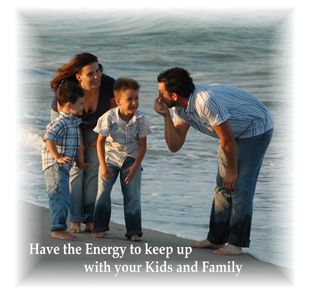 Energize Your Life! The latest release includes a significant improvement in stability and power, boosting the overall bio-energy efficiency and is available as an upgrade for all users of the models 4100, 4105 and the q46 pro, which comes highly recommended. Please note: All q47 Pro direct from factory upgrades will need to be shipped to Q the Experience Australia, Future Life Science. Please feel free to contact us any time:- Q the Experience, Future Life Science. "Body chemistry is governed by quantum cellular fields" Murray Gell-Mann, Nobel Prize Laureate, 1969. With the QEnergySpa, BEFE you can experience bio-energy levels similar to that enjoyed at world famous mineral springs such as Lourdes in France and Baden-Baden in Germany. The QEnergySpa, BEFE can be enjoyed in the comfort of your own home with a hand, foot or full body bath. Throughout history, people have been drawn to naturally occurring highly energized mineral springs for their healing, rejuvenating and revitalizing effects. The innovative QEnergySpa, BEFE was conceived and developed in 1996, to recreate these same revitalizing energies in ordinary tap water in a way that nature has done since the beginning of time. Dennis Higgins speaking at a conference in Toronto, Canada. Non invasive and built to satisfy Stringent International Electrical Safety Standards, IEC 60601.1 and domestic CE mark compliance. Manufactured in Australia, the QEnergySpa, BEFE is unlike any technology available on the market today, owing not only to the science it is based upon (Quantum Reality Field Science, QRFS) but also to the highly specific design details of the Orb (water module) and the manufacturer specified electronically matched circuitry components within the three available power supplies. The QEnergySpa, BEFE is the ultimate revolution in natural bio-energy re-vitalisation for your body, capable of assisting the human body to function at its full capacity and provide you with more energy to effectively cope with today's stresses. 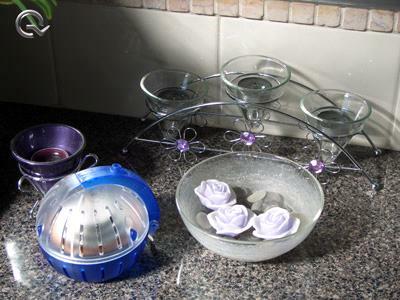 Using the QEnergySpa, BEFE is simple and you do not need to be a professional to operate the device. In fact providing that you have a tub of some description, almost any one can use the unit; be it for use in your own home or in a professional clinic. This method does not involve any medications and it is safe and non-invasive, it can even be used on children and pets. The QEnergySpa, BEFE is based on the principle that all living matter contains a "bio-charge" or bio-energy. This energy is what enables all the systems of the body to operate. The efficiency of operation of these systems within our bodies is determined by the energy level of our body. When the body has a high energy level, all the body s systems will operate efficiently as a collective whole, allowing the body to regenerate at its peak. However, much like a battery, our energy levels do not stay at a fixed level. The lifestyles we lead and the toxins we breathe and ingest means that many of us are depleting our body's natural resources, increasing the likelihood of falling prey to various exposures. The QEnergySpa, BEFE was created to re-balance and amplify the bio-electric signature of your body and is the only available Bio-Energy device capable of creating the necessary complex field interactions within the water. Thousands of people around the world testify to the QEnergySpa, BEFE's numerous benefits and research conclusively back up their claims. As the water becomes 'one' with us, it takes on our unique energetic resonance signature as a template. This incredible phenomena is due to the Quantum Field created by the specific design of the water module and is exclusive to the QEnergySpa, BEFE. Water makes up the largest portion of the human body mass and it is the primary constituent of all life. Water serves as the soup in which all biochemical processes occur and it is the most common element on this planet. Now, that is .... Energy for life. Disclaimer: Please note that the QEnergySpa, BEFE is not offered, nor intended to diagnose, cure, mitigate, prevent or treat any disease or health condition and is not a medical device. Use only as directed and consult your primary health care provider if you have any medical concerns and/or if symptoms persists. The bio-energy therapeutic quality from the use of the QEnergySpa, BEFE is derived from the interaction of the complex resonant field created within the water by the water module, the ORB. All ionic or electrolysis processes ONLY results in discoloration and precipitation within the water and although interesting and a point of discussion, it is irrelevant to the process and effect. There are far too many parameters that affect the colors and smells of the water after use of the QEnergySpa, BEFE (or any other similar kind of technology) and although every person's outcome in the water is different (you affect the outcome, but it does not come from you), please remember that you cannot and should NEVER diagnose or rely on the water colors and or smells in any way.